Upon completion of his basic training Peter Wiens was posted to No. 2 AGGTS in Trenton Ontario. Although the Air Gunners Ground Training School was only in existence for a short time it was the forerunner of next generation of Air Gunnery schools. Peter Wiens was in one of the last classes to pass through the AGGTS when he completed the course on October 15th 1943. His next posting was to MacDonald Manitoba to attend the No.3 Bomb and Gunnery school located there. After a few short weeks he was on his way to "Y" Depot, an embarkation point for all RCAF personnel headed for overseas operations. Why the "Y", the "E" that could have been used as embarkation was already in use. It was not until mid-February when he would leave the No.3 Reception center in Bournemouth and report to No. 22 O.T.U. at Pershore the later to No. 22 O.T.U. at Atherstone. Where he would become a member of a crew and train together with his new crew mates to practise their skills as a team. It was also while at No.22 that he had an accident with a car while at Stratford-on-Avon leaving him with cut to the head and concussion. He also would be posted to yet another gunnery school, No. 6 at Dalton to learn new gun systems and tactics from experienced gunners who had already completed their tours. All this extra training would be further enhanced by his time with his crew at No. 1666 H.C.U. By the beginning of July of 1944 he was with the 419 at Middleton St. George. 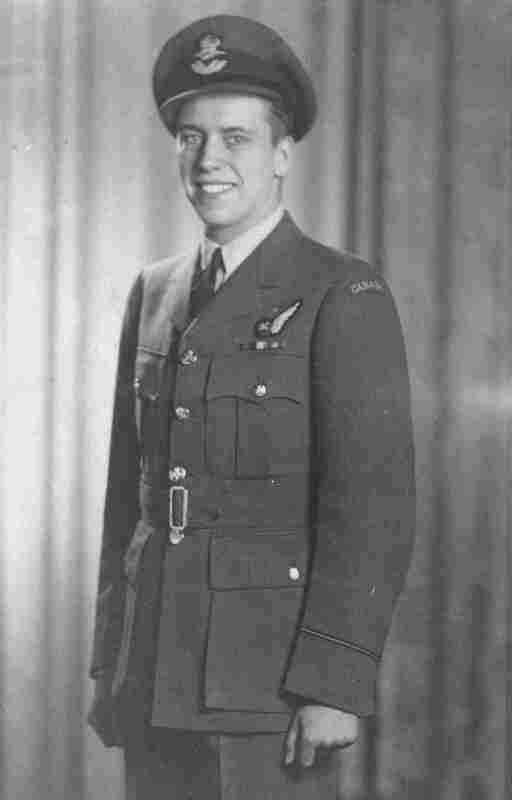 It was not until July 15th before P/O Milner, the pilot Weins was to fly with, had completed his turn as Second Dickie. A part of the on the job training any aircraft captain had to complete prior to commanding his own crew on a squadron operation mission. Three days later Sgt. Weins was on his first full mission as rear gunner to Caen. The records mention that Wiens injuries were minor and although that may be true he had just lost four friends he had flown with from as far back as when they were all brought together at No. 22 O.T.U. something the cold printed pages of the squadrons operations logs never mention. By the beginning of December or maybe sooner he was back flying over enemy territory in his normal work place, rear gunner. First flying with F/L Cox which was to bring one more close brush with danger. The January 2nd raid on Nurnberg while flying with the Cox crew VR-S their aircraft was hit by Allied artillery when over the battle zone heading east towards the target, it was the only 419 aircraft damaged but not the only aircraft shot at by friendly ground forces. By April of ‘45 he was flying with F/L Dawson’s crew, one he stayed with all the way to back home. With the end of the war 419 squadron pilots and navigators were preparing themselves for a new adventure, bring the Lancasters back home to Canada. There were new things to be learnt , astro-navigation since there would be no beams or beacons to follow home. And maybe the one course which stuck the fact that they actually going home, the DOT transport course. Flying bombers to their bases was one thing, flying them into airports was all together different. So now flying as a passenger on an aircraft he had defended on numerous operations he was headed home. He would remain with 419 until the squadron was disbanded.